Upcoming Serie A season won't be easy for the two teams that have no home. Cagliari still struggle to be granted safety certificate, while Udinese just launched complete redevelopment of their stadium. 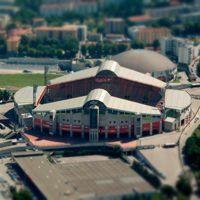 Though both clubs are allowed to change venues thoughout the 2013/14 season, primary one indicated in their license is Stadio Nereo Rocco in Trieste. Thus, both clubs may spend as long as the entire season in Eastern Italy, if necessary. The 32,000-capacity stadium has already seen many Serie A games, but first time ever will see two top flight clubs using it simultaneously. It's not even in terms of conditions for both sets of fans as Udinese have only some 76km to travel, while Cagliari lies massive 1,000km away and few people should be expected to travel for 'home games' from the Sardinian city. No wonder Cagliari are hopeful of getting their safety certificate for Stadio Is Arenas as soon as possible. When exactly? This is still unclear as amendments need to be done to the access routes and only then may such a certificate be given. As for Udinese, their move is forced by redevelopment of Stadio Friuli beginning. Over the next several months the club will see three of Friuli's stands replaced by new ones, converting the stadium to a football-specific one first time in history. The 'Zebras' may be able to return to their home ground even while works are still ongoing.